Short-list of sites for community consultation before the end of the financial year and a steering committee sooner, says Chansey Paech, Assistant Minister for the project. KIERAN FINNANE reports. 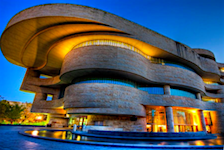 Pictured is the National Museum of the American Indian in Washington DC, one of Mr Paech’s benchmarks.